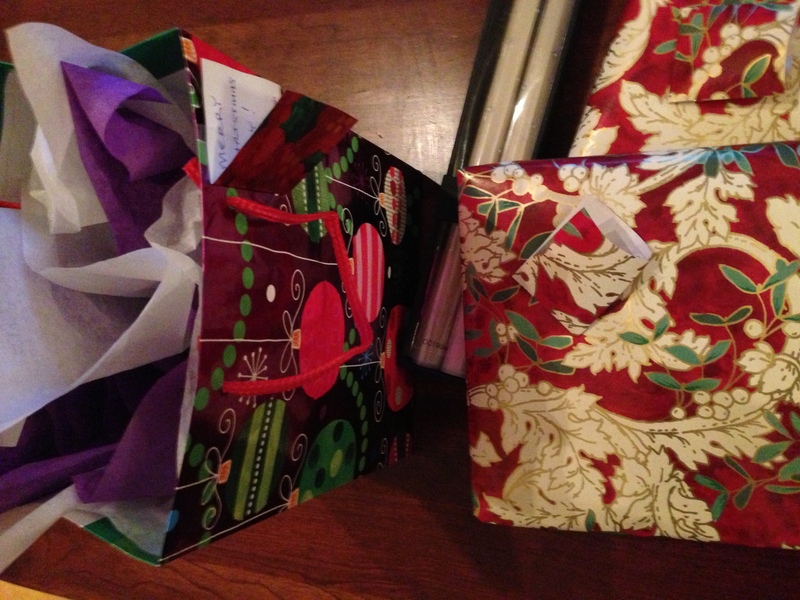 Clump #86: Wrap more presents; make dining room reservations; reconnect with gift list. Today I reminded myself how easy it is to get a few, or even a big clump of tasks done early for the holidays … and then fall into a false sense of security. And then … AHH! The days have dwindled down. Emails, catalogs, and flyers are blaring the words “There’s Still Time To Order,” but what you had in mind will be more expensive with extra shipping charges, or is no longer in stock and back-ordered into the new year. I might have to have this little talk with myself a few more times before the end of my 30-day, 30-clump, 30-post: Project Enjoy Christmas challenge is over. I did get a few more gifts wrapped and written on The List, which was a good memory jog for other things I still need to do/buy. Remember, remember! One item on my to-do list that felt checked off was reserving space in a private dining room where my mom lives for Thanksgiving and Christmas dinners. I had called the woman — twice — who helped me out last year, but no answer. Was she afraid to tell me someone else had beat us to it? Yikes! So today while visiting, I made a point of asking in person. Turns out the woman I spoke with last year is no longer working there. Finally, the job is done and a big weight is off my mind. Visiting with my mom is such a delightful experience. She is compromised in ways common to people her age, but she has the greatest attitude. Her favorite thing to say, about anything, is “Wonderful, wonderful!” I really hope I’ll be able to face old age with even half her grace and good cheer. 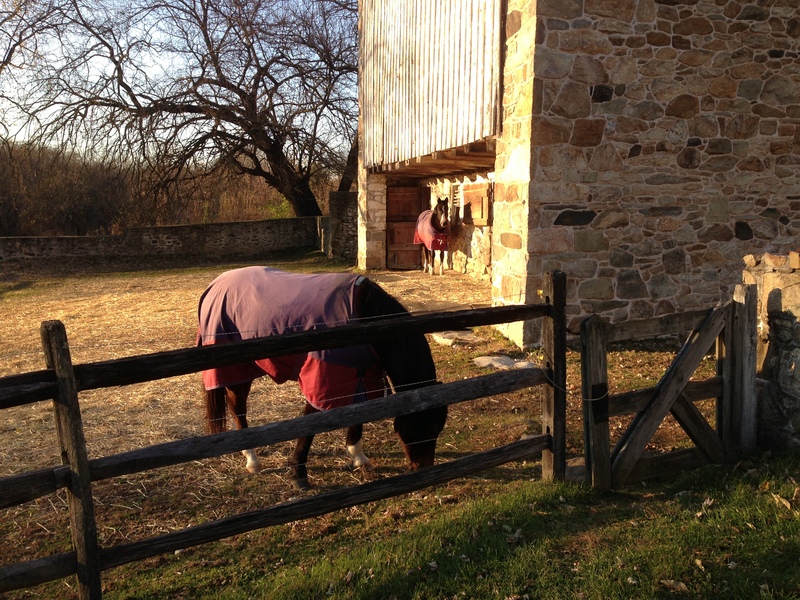 As usual, when driving through Lancaster County, I got onto a photo-taking binge. 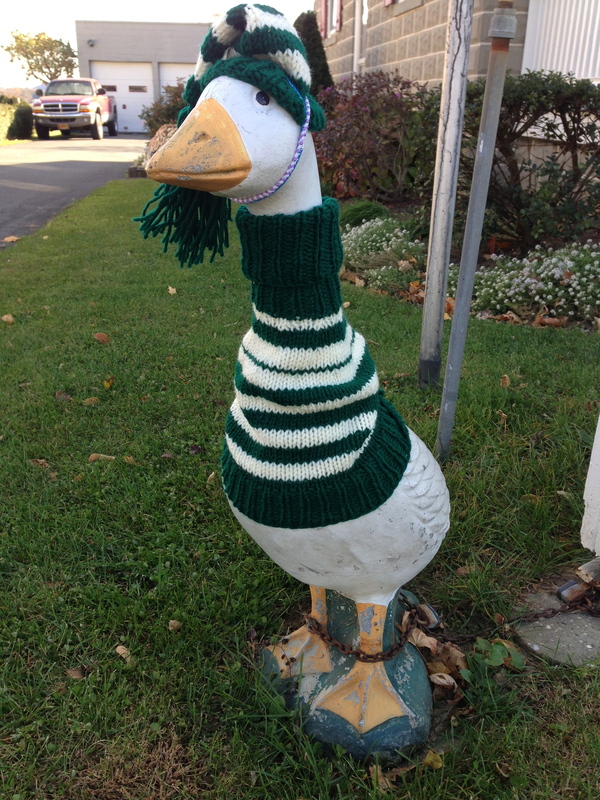 Regular readers will recognize this goose in the town of Strasburg, PA, who has different outfits for every season. She, let’s call her Lucy Goosey, had broken out her woolens. Highly appropriate for the cold weather we’ve been experiencing. 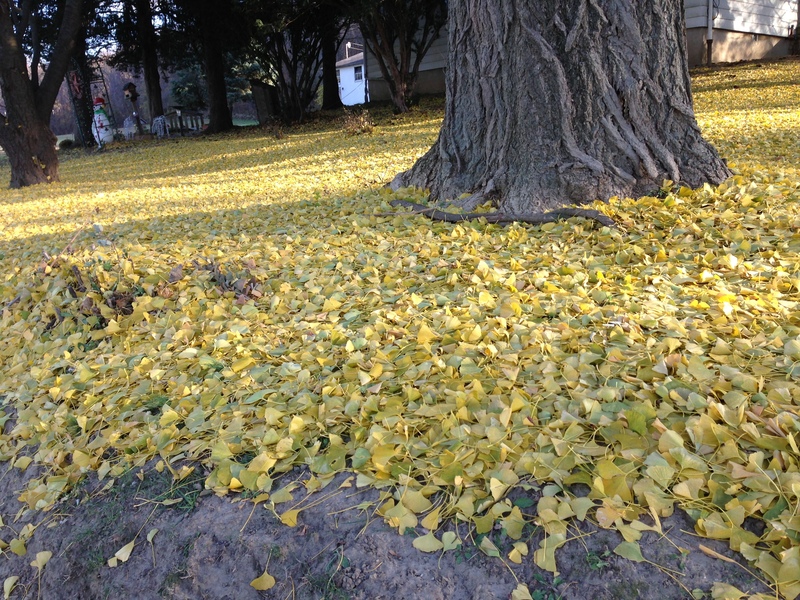 I was taken by a lawn blanketed with fallen ginkgo leaves and a plastic snowman (upper left corner) holding forth. To capture the photo, I had to pull into a street quite a distance away. I was pleasantly surprised by a woman who stopped her car and asked whether I needed a ride. “What wonderful people out here in the country,” I thought. My rosy-eyed view of the locals quickly changed when a man (non-Amish) came out of the house next door to this one, shouting, “What’s going on? !” with a threatening tone. I shouted back, “I was just taking a picture.” He didn’t look satisfied, so I added, “The leaves are so pretty,” to which he turned and retreated. I thought, as I high-tailed it out of there, we say “taking,” not “making” a picture for a reason. 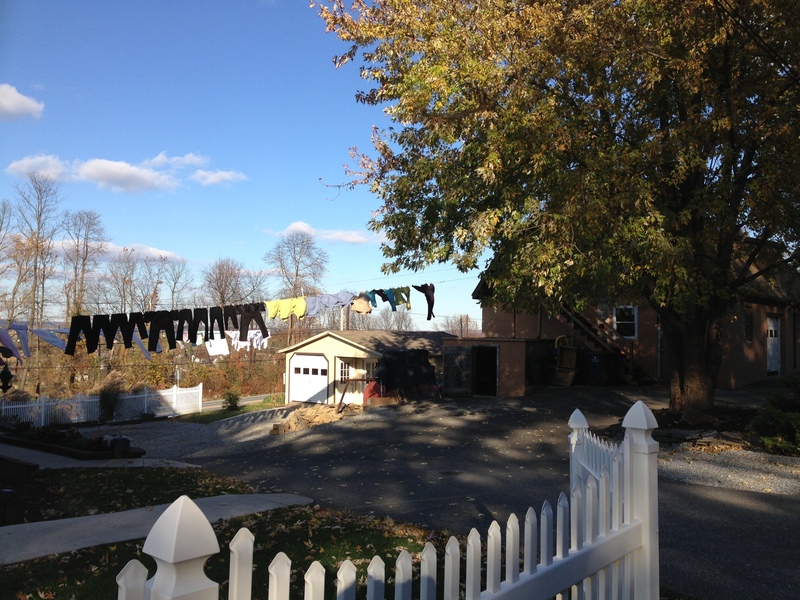 An element of trespass is part of the act. 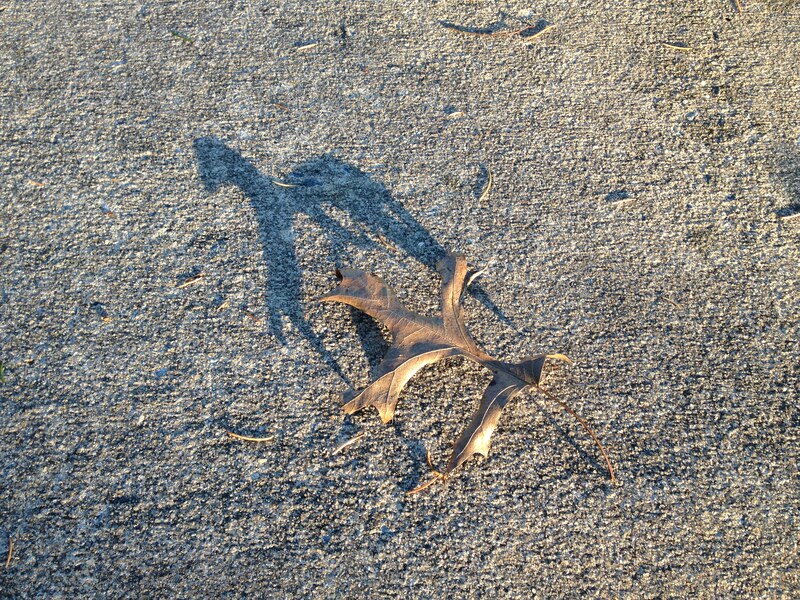 As I was walking away, I saw this leaf on the sidewalk making a horse-shaped shadow. It is to the people who step care-fully and with a wide-eyed approach to the world to whom gifts such as the leaf/horse are given! Thanks, Judy! You are just amazing, Judy! Thank you for sharing your thoughts and pictures with us.